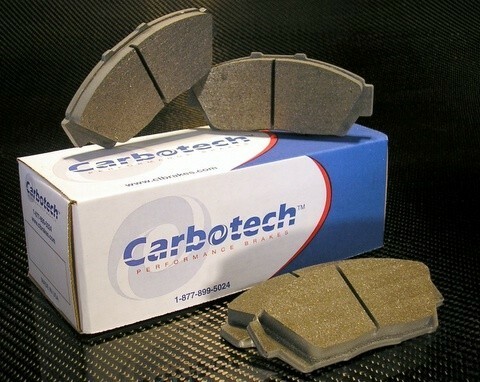 The Carbotech AX6™ is specifically engineered for Autocross applications. AX6™ has uprated initial bite, higher coefficient of friction, and more progressive brake modulation and release characteristics compared to the 1521™. AX6™ offers high fade resistance, rotor friendliness, excellent cold stopping power, and non-corrosive dust. AX6™ has gained tremendous popularity with SCCA Prosolo/Solo2 competitors. Although AX6™ can be driven on the street on for higher performance applications, it is NOT a race compound, and should not be used as such. Cars in excess of 300hp and/or 3,000lbs should not use AX6™ for any track use. Elevated dusting and noise from brake use is to be expected compared to the 1521™ compound.